The East Bay’s first oil refinery opened in 1896 near the site of Porkopolis-of-the West, a defunct stockyard and slaughterhouse in the town of Rodeo. In the ensuing decades, four more East Bay refineries joined it, defining the region and powering its growth like no other industry. A century later, the Contra Costa-Solano refinery belt, California’s largest, continues to cast an enormous shadow over surrounding cities, influencing their politics, their economies, even their aesthetics. And at a time when fossil fuel seems like yesterday’s energy source, the Bay Area’s five refineries have all embarked on ambitious projects to transform the way they do business — and ensure their economic viability in a rapidly changing global energy market for decades to come. These projects, if seen to completion, will diversify the refineries’ operations by allowing them to process both dirtier, heavier oil and cleaner, lighter crude. Two refineries are looking to build their future, at least in part, on crude-by-rail operations, expanding available sources of petroleum while intensifying a controversy over whether that transportation method endangers East Bay communities. All told, the upgrades will generate a collective investment in the East Bay of more than $2 billion, while adding hundreds of construction jobs. And once they are completed, proponents say, the projects should result in a substantial combined cut to greenhouse gas emissions, even though many environmentalists remain unsatisfied. Catherine Reheis-Boyd, president of the Western States Petroleum Association, said oil companies are looking to increase efficiency through these refinery projects while meeting the state’s stricter environmental requirements — not an easy balancing act. Even without the new projects, the five East Bay refineries are a critical part of the local economy. In 2012, Chevron, Tesoro, Shell, Phillips 66 and Valero processed a total of about 800,000 barrels a day of crude oil, providing more than 7,500 direct jobs, according to industry sources. The oil and gas industry as a whole in the Bay Area generated $4.3 billion that year in state and local taxes, plus another $3.8 billion in federal taxes, according to an April 2014 Los Angeles County Economic Development Corporation study commissioned by the Western States Petroleum Association. The biggest project underway is at Chevron, a $1 billion investment to upgrade parts of its century-old 2,900-acre Richmond refinery allowing it to refine dirtier blends of crude with no increase in greenhouse gas emissions, according to the project application. Tesoro’s Golden Eagle refinery, near Martinez, has spent nearly as much on upgrades since 2008, and other projects are underway at Shell in Martinez, Phillips 66 in Rodeo and Valero in Benicia. While these sweeping investments offer the promise of new jobs and cleaner, more efficient operations, many environmentalists complain that they don’t go far enough to curb emissions of greenhouse gases that contribute to global warming by trapping heat in the lower atmosphere, and sulfur dioxide and other pollutants that can cause serious health problems in people in surrounding communities. And others warn that the improvements will smooth the path for highly flammable crude oil from North America’s Bakken shale region to the East Bay on railroad lines, raising the specter of spectacular explosions from train derailments, as happened last summer in Lac-Mégantic, Quebec, where 47 people died. Those fears have dominated debate over a proposed rail terminal at Benicia’s Valero refinery. A growing number of detractors clamor for America to cast off the yoke of fossil-fuel dependency altogether and concentrate on efforts to develop cleaner, renewable energy. “The missed opportunity here is for the oil companies to refocus their sights on the future of renewable energy,” Griffith said. That aim, albeit more gradual, is the policy of the state under Assembly Bill 32, the California Global Warming Solutions Act of 2006. The legislation calls not only for reducing greenhouse gas emissions but also for reducing the state’s dependency on petroleum. The refineries take that as a challenge but not a death warrant. Juhasz cited Canadian tar sands oil as the prime example of dirtier crude, and pointed to oil from the Bakken shale formation, mostly in North Dakota, as the prime example of the more dangerous variety. “Demand is going to continue to increase, and there haven’t been any new refineries built in the U.S. in decades. So what we’re left with is these projects in existing refineries designed to improve efficiency and flexibility,” he said. • At Tesoro’s Golden Eagle refinery, one of the biggest shifts has been bringing in up to 10,000 barrels per day of Bakken crude, which company officials say is critical to replace other sources of petroleum. “Our challenge going forward is, as California and Alaskan crudes decline, to find replacements that keep the refinery a viable business,” General Manager Stephen Hansen said. “One of those crudes is in the midcontinent, and the only way to get it here is by rail,” he added, noting that the refinery receives crude from ship, pipeline and truck after offloading it from rail cars in Richmond. The refinery’s nearly $1 billion in capital upgrades since 2008 have focused not on increasing capacity but on using a wider variety of crude blends and processing them more efficiently, cleanly and safely. A $600 million replacement of the refinery’s coker, for example, has reduced annual carbon dioxide emissions by at least 400,000 tons, according to refinery officials. • Shell’s Martinez refinery is seeking to shift some of its refining capacity toward lighter crudes, which it says will allow it to trim greenhouse gas emissions. In phases over several years starting in 2015, the refinery would build processing equipment and permanently shut down one of two coker units, resulting in a reduction in greenhouse gas emissions by 700,000 tons per year. Shell spokesman Steve Lesher said the project involves replacing equipment, not expanding the facility beyond its 160,000 barrels per day. He also said the refinery currently processes heavier oil from the San Joaquin Valley but will be bringing in oil from other, as-yet-unidentified sources. • Phillips 66 in Rodeo, the region’s oldest refinery, hopes to start recovering and selling the propane and butane that are a byproduct of its refining process, rather than burning them off in a highly polluting process called flaring or using them as fuel in refinery boilers. The project would add new infrastructure, including a large steam boiler, propane and butane recovery equipment, six propane storage vessels and treatment facilities and two new rail spurs. Phillips 66 has said the project, which was approved by the county Planning Commission in November, would reduce emissions of sulfur dioxide by removing sulfur compounds from refinery fuel gas, and reduce other pollutants and greenhouses gases, but those assertions have been questioned by environmentalists and the Bay Area Air Quality Management District, which wants further evaluation before signing off. Two groups have filed an appeal to overturn the Planning Commission’s approval, and in what might be a first for the region, the air district is requiring that the project’s emissions and possible health effects must be considered cumulatively with other refinery-related projects in the Bay Area. • Chevron’s plan, which received City Council approval in July after months of intense public debate, is touted as an important upgrade in an increasingly competitive global petrofuels market. While other refineries are gearing up to exploit the North American oil boom, Chevron will continue to get the bulk of its oil from the Persian Gulf and Alaska. But the new modernization plan approved in July would allow the refinery to process crude oil blends and gas oils with higher sulfur content, which refinery officials say is critical to producing competitive-priced transportation fuels and lubricating oils in the coming decades. In addition, it would replace the refinery’s existing hydrogen-production facilities, built in the 1960s, with a modern plant that is more energy-efficient and yields higher-purity hydrogen, and has the capacity to produce more of it. • Valero Refining wants to build a $55 million crude-by-rail unloading facility at its Benicia refinery that could handle daily shipments of up to 70,000 barrels of oil transported in two 50-car trains daily from sources throughout North America. That plan has drawn sharp criticism from locals and leaders in Sacramento concerned about the hazards of increased rail shipments. The project would not increase capacity at the refinery but replace crudes that are currently delivered by ship. Nor would it increase emissions from refinery operations, according to a project description on the city of Benicia’s website. The document also cites an air quality analysis indicating that rail cars generate fewer emissions locally than marine vessels. The latest projects, while still drawing criticism, have turned some critics into allies. Henry Clark of the West County Toxics Coalition, who played a leading role in getting millions of dollars in settlements for North Richmond residents stemming from a chemical spill linked to the Chevron refinery in the early 1990s, has come out in support of the Chevron modernization. After months of investigation and more than one delay, Benicia released the draft of an environmental report on the Valero Crude-by-Rail Project on Tuesday. The city chose to have the report drafted to meet requirements of the California Environmental Quality Act after Valero Benicia Refinery sought a permit last year to add more Union Pacific Railroad track onto its property so it could bring in North American crude oil by rail car. The report “discloses to the public and the city’s decision-makers the environmental consequences” of Valero’s proposed project, citing minimal impacts in several areas but “significant and unavoidable” impacts on air quality. In addition to the project as proposed by Valero, the draft report (DEIR), written by San Francisco-based firm ESA, examined four alternatives, ranging from not doing the project at all to modified versions, including one that proposes cutting the rail delivery of crude oil to the refinery in half. “The main issue to be resolved in the EIR is which among the alternatives would meet most of the basic project objectives with the least environmental impact,” the report said. “Balancing sometimes competing environmental values can be challenging because it rests on assumptions of relative value,” the report said, explaining that city officials who will be deciding whether to adopt the final environmental report and issue a use permit may have to balance the relative value of those environmental resources. In doing so, they may resolve the issues that have been examined in the report and reach different conclusions than those reached by ESA. The DEIR examined and assessed the direct, indirect and cumulative environmental impacts of the construction, operation and maintenance of the project. The analyses are based on information submitted by Valero in its application for the use permit; the consultants made no recommendation how the matter should be decided. The report analyzed in detail the project’s impact on air quality, biological resources, cultural resources, energy conservation, geology and soils, greenhouse gas emissions, hazards and hazardous materials, hydrology and water quality, land use and planning, noise and transportation and traffic. The consultants determined that in 10 of those 11 areas, the project could result in no or less-than-significant impacts. But the project would have “significant and unavoidable” impacts to air quality, particularly outside the Bay Area. The Crude-by-Rail Project as proposed by Valero would provide an alternate means of delivering crude oil to the refinery. Up to 70,000 barrels of day of North American-sourced crude oil would arrive daily by rail, replacing marine vessel delivery of the same amount. The report noted ways the project could be put in place while reducing its environmental impacts through mitigation methods. It said the project would not change existing refinery operations, and said the plant would continue to meet requirements of existing rules and regulations governing oil refining, including the state of California Global Warming Solutions Act of 2006. The project wouldn’t increase the amount of oil the refinery receives, nor allow the refinery to produce more than the limits it already has on its output, the report said. But it does change how the refinery would get its raw materials. Assuming that the average ship holds 350,000 barrels, the project would displace as many as 73 ship deliveries a year, the report said. It could displace the total quantity of crude oil delivered by marine vessel to the refinery by as much as 25,550,000 barrels in a 365-day year. Based on the deliveries from Dec. 10, 2009 to Dec. 9, 2012, annual marine vessel deliveries would be reduced by as much as 82 percent, the report said. The refinery has a dock between the Benicia-Martinez Bridge and the Port of Benicia wharf. The refinery’s marine terminal currently receives and ships bulk cargo by marine vessel. But it already has some existing Union Pacific Railroad rail tracks that provide access to the refinery and the Benicia Industrial Park. The refinery already uses tank cars to receive chemicals used in refining and to ship refined products out, the report said. The project would install a new tank car unloading rack capable of unloading two parallel rows of tank cars, one on each side, and transferring that crude oil to the refinery. This would be on the northeastern part of the main refinery property, between the eastern side of the lower tank farm and the fence adjacent to Sulphur Springs Creek. The new tank car unloading facilities would include a liquid spill containment sump with the capacity to contain the contents of at least one tank car. In addition, the existing liquid spill containment for tanks abutting the tank car unloading facilities would be modified to allow installation of the unloading facilities. Part of the existing containment berm for the tank field would be removed and a new concrete berm would be built about 12 feet west of the existing earthen berm, the report describes. The project would install about 8,880 track feet of new track on refinery property — three new track turnouts and one crossover — and would realign about 3,560 track feet on refinery property. New rail spurs and parallel storage and a departure spur would be built between the east side of the lower tank farm and the west side of the fence along Sulphur Springs Creek. Also part of the project are crude oil offloading pumps and pipeline, and associated infrastructure, spill containment structures, a firewater pipeline, groundwater wells and a service road. It also would include the construction of 4,000 feet of 16-inch-diameter crude oil pipeline. Should the project be approved, construction is expected to take 25 weeks, involving about 121 construction employees working daily until the project is finished. Afterward, it would provide jobs for 20 more employees or contractors, the report said. If built, the refinery would be able to accept up to 100 tank cars of crude oil a day in two 50-car trains entering refinery property on an existing rail spur that crosses Park Road. The crude would be pumped to existing oil storage tanks by a new offloading pipeline that would be connected to existing piping within the property. “Valero would ask UPRR to schedule Valero’s trains so that none of them cross(es) Park Road during the commute hours of 6 a.m. to 9 a.m. and 4 p.m. to 6 p.m.,” the report said. Valero would operate the project components 24 hours a day, seven days a week and every day of the year. The North America-sourced crude would arrive in Benicia through Roseville, where cars would be assembled into a train specifically for shipment to the refinery. Valero would own or lease the tank cars (a common practice), and Union Pacific would own the locomotives that pull the train. Under regulations adopted by the Pipeline and Hazardous Materials Safety Administration (PHMSA), crude oil shipped by rail must be shipped in tank cars built to the DOT-111 specification. But in 2011, the Association of American Railroads voluntarily imposed more stringent standards on the design of the DOT-111 tank cars, and the sturdier tank cars are numbered 1232. DOT-111 cars ordered after Oct. 1, 2011 are supposed to meet the new standards; the older ones that aren’t as strong are called “legacy” DOT-111 tank cars. “Valero has committed that, when the PHMSA regulations call for use of a DOT-111 car, Valero would use 1232 tank cars instead of one of the ‘legacy’ cars,” the report said. The report looked at alternatives to the project as the refinery described what it wanted to do in its application. Those include a “no project alternative,” wich “would result in higher emissions of criteria pollutants and greenhouse gases within California. The DEIR covered two other alternatives. One would limit cars to a single 50-car train delivery a day, and the other proposed two 50-car trains arriving at night. While the first alternative would reduce the amount of emissions coming from trains, it also would mean that Valero would be unable to reduce as much emissions that come from tanker ships making deliveries. However, it might reduce impacts to local traffic at Park Road during peak traffic times, the report said. Union Pacific has taken the stand that limits on volume of product shipped or frequency, route or configuration of the shipments would be preempted under federal law. “Thus, Alternative 1 may be legally infeasible,” the report said. A second “reduced project” alternative would require trains crossing Park Road to do so only between 8 p.m. and 6 a.m. The report found the noise generated at night would be “less than significant,” but noted that having all the trains arrive and depart at night might be noisier than the way the project originally is proposed. Another alternative would have the receiving terminal accepting the train’s oil to be built offsite, and would involve a third party. The oil would be transferred either by tanker ship or a new pipeline. This would cause greater impacts than the original proposal, the report said. The report looked at eight areas of concern noted during extensive public comment, particularly during the coping phase of the environmental report Aug. 9 to Sept. 13, 2013. Those involved the properties and parameters of crude oil to be transported and refined; the relationship of the project to the Valero Improvement Project; effects of train operations on local and interstate traffic; effects of construction, operation and transportation on air quality; how the project would affect plant and animal ecology at Sulphur Sprints Creek and Suisun Marsh; what hazardous materials would be released during an accident, and how such accidents would be handled; and the range of potential effects from the time crude is extracted until it’s delivered in Benicia. “Where significant impacts are identified, feasible mitigation measures are proposed that would reduce each of these potential impacts to a less-than-significant level,” the report said. Based on the results of the initial studies made before the city chose to have the EIR drafted, the report doesn’t examine the project’s relationship to agriculture, forests, minerals, aesthetics, population and housing, public services, recreation, utilities and service systems, which the project either wouldn’t affect or have less than significant impact. The EIR also doesn’t include seven items Valero considers confidential business information. Under CEQA, a lead agency — in this case, the city of Benicia — may require an applicant to submit data necessary to making a decision on the project, but if the information is considered “trade secrets” as defined by government code, the information isn’t included in an EIR. Those topics are the specific North American crudes Valero plans to buy, publicly defined as “light, sweet” crude; the weight, sulfur content, vapor pressure and acidity of specific crude blends processed at the refinery; data bought by Valero that shows those properties of various crudes; detailed information about the crude blends suitable for the Benicia refinery based on its unique configuration; and detailed daily measurements of weight and sulfur content of crude blends processed at the local refinery in the past. The city agreed to keep that information confidential because of its “competitive value,” or because disclosure could allow other refiners to claim violation of antitrust laws. However, the document noted that based on the refinery’s operation, the optimum range of weight and sulfur for crude blends is narrow, between 24 and 29 degrees American Petroleum Institute gravity, with a sulfur content ranging from .08 percent to 1.6 percent. The report noted that light, sweet crude is available from Canada, Texas, Wyoming, Colorado, North Dakota, Utah and New Mexico. Light, medium and heavy sour crude comes from Canada. Valero Benicia Refinery produces 10 percent of the California Air Resources Board (CARB) gasoline used in California, and 25 percent of the CARB gasoline used in the San Francisco Bay Area, and it also produces jet fuel, liquefied petroleum gas, heating oil, fuel oil, asphalt, petroleum coke and sulfur. The Bay Area Air Quality Management District permits Valero to process up to 180,000 barrels of crude oil a day, though it averages 165,000 barrels daily. It exports petroleum coke and liquid petroleum gas, and already uses rail cars to move products off refinery property to the AMPORTS Benicia Terminal. Materials then are stored in silos until they’re loaded onto marine vessels. The report said substituting rail cars for maritime crude delivery of the crude would eliminate 11,707 metric tons of carbon dioxide emissions from ships every three years. The 6,726 metric tons of carbon dioxide released in a year in association with the project is below the annual “conservative significance threshold” of 10,000 tons of carbon dioxide, it said. The report said that delivery of crude oil by large line haul tank cars would reduce overall emissions outside California when compared to delivery of crude oil by ships. According to the report, the U.S. Environmental Protection Agency has identified ozone, nitrogen dioxide, carbon monoxide, particulate matter and a variety of other pollutants, including sulfur dioxide and acid rain, as “criteria pollutants” because standards have been established to meet public health and welfare criteria. The Bay Area Air Quality Management District (BAAQMD), which has a monitoring station on Tuolumne Street in Vallejo, records those pollutants and notes the meteorological conditions that can affect air quality. The report said that station is close enough to Benicia to have similar background pollutant concentrations, an assumption confirmed by an air monitoring study conducted 2007-08 just west of the refinery. However, the report said the project wouldn’t conflict with or obstruct implementation of any applicable air quality plan. The report noted that the refinery is in an industrial district and owns 470 acres of mostly undeveloped property that buffers two sides of the refinery campus. It has general industrial use neighbors on its other two sides. Past Valero’s buffers are residential neighborhoods, and the closest homes to the project would be in neighborhoods no closer than 2,100 feet northwest of the northernmost part of the new unloading racks. The report, which used three-year averages from December 2009 to November 2012 for its calculations, said emissions from the refinery wouldn’t increase as a result of the project. The report found the project complies with the BAAQMD Bay Area 2010 Clean Air Plan (2010 CAP). While the new unloading rack and piping could generate 1.88 tons annually in fugitive reactive organic gas (ROG) emissions, the project’s only direct operational air quality emissions, it said that would be more than offset by reduction in maritime ROG emissions once the project becomes operational. “The project would not have any other direct operational impacts on air quality,” the report said. There would be no changes in the refinery’s operations, nor increased emissions from processing because of the refinery’s narrow range of weight and sulfur content of the crude it processes, it said. Nor would storage tanks contribute to any emissions. Even the construction segment, which had potential to interfere somewhat with Bay Area air quality, could be mitigated with the air district’s basic control measures, the report said. However, long-term emissions from locomotives could contribute to air quality violations in the Sacramento Basin, because reduction of maritime emissions wouldn’t be available to provide compensation, the report said. Again, since locomotive emissions are regulated at the federal level, Benicia can’t impose any emission controls on tanker car locomotives. “The impact would be significant and unavoidable,” the report said, with no available mitigation. The report noted that even if railroad-caused emissions increase in North America as crude travels to Benicia, maritime emissions from ships traveling from Alaska, South America, the Middle East and other parts of the world would decrease. However, “These emissions can be described only in general terms because it is impossible to identify and quantify emissions across the vast range of possible routes,” the report said. Any impacts on the surrounding environmentally sensitive areas and such inhabitants as nesting birds and threatened or endangered species could be prevented through mitigation measures such as buffers, storm water pollution prevention, care about light placement and other measures, the report noted. Inhabitants of the federally protected Suisun Marsh already are acclimated to the sounds of rail traffic, it said, and while additional rail traffic may briefly disturb them they also would become used to the sounds. If any of the 730 trains traveling through the marsh annually caused an oil spill in the vulnerable marsh, the report said that could be “a significant impact,” especially on special-status species. The Federal Railroad Administration requires railroads to meet or exceed national safety standards, including those dealing with earthquakes, and the California Building Code also would come into play, the report said. Instead, it focused on homes and businesses near the refinery’s rail unloading area, those along the transportation route and around the environmentally sensitive Suisun Marsh from Roseville to Benicia. Federal and state regulations require annual reports of hazardous chemical inventories, and Solano County companies such as the refinery must comply with local and county regulations as well, the report noted. In response to several rail accidents involving crude oil and ethanol, federal regulatory agencies and the Association of Railroads (AAR), an industry trade group, have collaborated to reduce risks. It took the NTSB until 2012 to note that the DOT-111 tank cars were inadequate, and the board’s report said the track structure was washed out by a flash flood. The board began urging PHMSA to adopt stricter specifications for tank cars that carry ethanol or crude oil. Instead of waiting for PHMSA to act, the DEIR said, AAR voluntarily imposed more stringent standards for the tank cars, requiring thicker tank shells and heads; higher tensile strength; normalized steel to reduce damage to cars during an accident; protective steel head shields at both ends of the cars; consolidated top fittings beneath a “robust” steel protective housing; and a re-closing pressure relief device to reduce the likelihood of over-pressure if the car is involved in an accident or pool fire. The report also addressed the fatal derailment near Quebec, Canada that occurred last year. A train carrying Bakken field crude oil that derailed in Lac-Megantic, Canada, July 6, 2013 was using 72 of the DOT-111 “legacy” cars. In addition, the engineer and crew left the lead locomotive engine idling while the train was unattended. Someone reported a fire on the locomotive, which was tended by emergency responders. Left unattended again, the train began to move, gather speed and traveled 7.4 miles out of control down a grade until it derailed at 60 to 70 mph, spilling 1.5 million gallons of crude oil, which ignited and killed 47 people, destroyed 30 buildings and forced 2,000 people to evacuate. Legacy tank cars filled with sweet Bakken crude were part of a Nov. 8, 2013, derailment in Aliceville, Ala.; in the April 30, 2014 derailment in Lynchburg, Va., the DEIR noted that some of the cars were legacy DOT-111s, and the others were 1232 tank cars. The accidents “raise the concern that a release of Bakken crude is more likely to result in a fire or explosion because of its low flash point,” the report said. The Bakken oil field is one available source of North American crude Valero may purchase, and “it is important to consider these incidents,” the report said. The report said the FRA has responded to these accidents by issuing an order Aug. 2, 2013, to increase requirements before trains are left unattended. With PHMSA, FRA issued an advisory that same day about increased safety procedures. Since then, those DOT departments have issued additional safety requirements, some at the prompting or cooperation with AAR. The report also described regulations governing accidental release prevention, storage of flammable liquid and compressed gas, worker safety and emergency response. In Solano County, it noted, the emergency safety plan is administered by the California Emergency Management Agency, which coordinates the response of multiple agencies. In addition, Union Pacific has its own hazardous materials (Hazmat) response team in addition to a mandated emergency response plan. If a train were to derail between Roseville and Benicia, consequences could be minor in the case of a small spill, to “significant” if the spill were great or ignited, particularly in a residential or commercial area, the report said. Benicia hired Dr. Christopher Barkan to conduct a quantitative assessment about the probability of accidental release of crude oil from a Valero-bound train. The professor and executive director of the Rail Transportation and Engineering Center at the Department of Civil and Environmental Engineering at the University of Illinois at Urbana-Champaign provided an appendix to the report that noted the expected occurrence of a crude oil train release incident exceeding 100 gallons is about .009 a year, or once in 111 years. The DEIR called Barkan’s figures conservative, saying “they probably overstate the actual risk,” and said a motor vehicle accident between the two cities was 22 times higher than the risk of a Valero train oil release. Valero’s own emergency response procedures already are on file in its emergency procedures manual, which has been included in the report. 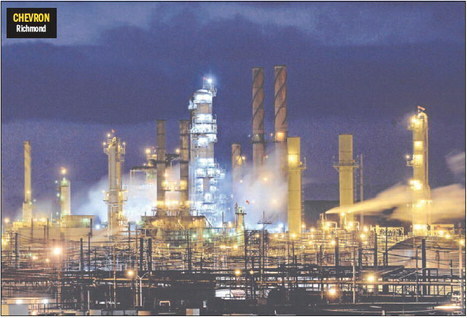 The refinery has its own fire department, and has agreements with Benicia and its fire department, the report noted. In case of an accidental spill or release of oil outside the refinery, its incident command system would be activated, in cooperation with such other agencies as the U.S. Coast Guard, California Office of Spill Prevention and Response, U.S. EPA, Solano County Department of Environmental Management and other emergency responders. Because of this, the report said, no other mitigation is needed. The Planning Commission accepted additional public comment July 11. Based on those comments, the city sent notice Aug. 9, 2013, that it would seek an EIR instead, and accepted public comments for 30 days about the scope of the report. The Planning Commission met Sept. 12, 2013 to hear public comment on the EIR scope to assure that areas that concern residents would be covered. Written comments were accepted through Sept. 13, 2013. During that time 18 people submitted written documents and eight oral comments were received, the report said. More comments were submitted after the deadline. The bulk of those comments aired concerns about the geographic area and potential indirect impacts of the project; the source of the crude feedstock; potential changes in the quality of that feedstock and how that would affect refinery operations and emissions; the relationship between this project and the Valero Improvement Project; the operational safety of railroads and trains hauling hazardous materials, including tank car specifications; and the cumulative effects of this project and similar ones planned elsewhere in California. The Valero Improvement Project (VIP), the bulk of which was finished in 2011, allows the refinery to process heavier, sourer crude — up to 60 percent, compared to the 30 percent maximum before the VIP project was undertaken. The project also let the refinery reduce the use of gas oil as feedstock and increase maximum crude oil throughout, the DEIR said. The refinery has permits through December to build a hydrogen plant associated with the VIP plans, but company officials told the DEIR consultants that the plant has enough hydrogen to meet the refinery’s needs. The Valero Benicia Crude By Rail Project Draft Environmental Impact Report is available to the public on the city’s website by clicking here. The public currently has 45 days to review and comment on the project, though the Planning Commission may decide to extend that period, since the group Benicians for a Safe and Healthy Community, organized to block the project, has asked for a 90-day review period. Comments also may be made before the Planning Commission July 12 in a hearing at which no vote is scheduled to be taken. After comments are received, the draft will be modified to address those concerns, and will be sent to the city as a final document to be circulated. If the final EIR is approved, Valero will receive its city permit to proceed, though the refinery must obtain permits from other agencies before construction would begin. The project requires an approved Authority to Construct from the Bay Area Air Quality Management District, but doesn’t affect the refinery’s operating permit or its emissions limit. Those interested may request a copy on CD by calling the Community Development Department, 707-746-4280. Print copies are available at the department at City Hall, 250 East L St., and the Benicia Public Library, 250 East L St.